Aged just 37, Mr. Tsang was working for the United Nations Environment Programme (UNEP). On the day of the accident, he was on a scheduled flight from the Ethiopian capital Addis Ababa to Nairobi in Kenya to attend the UN Environment Assembly. Tragically, Mr. Tsang, who was killed alongside a number of his colleagues, leaves behind a wife and children. Mr. Tsang had previously worked for World Vision and the United Nations World Food Programme, for the benefit of society. He then joined UNEP’s office in Kenya to actively promote environmental protection and women’s empowerment within the environmental sector. 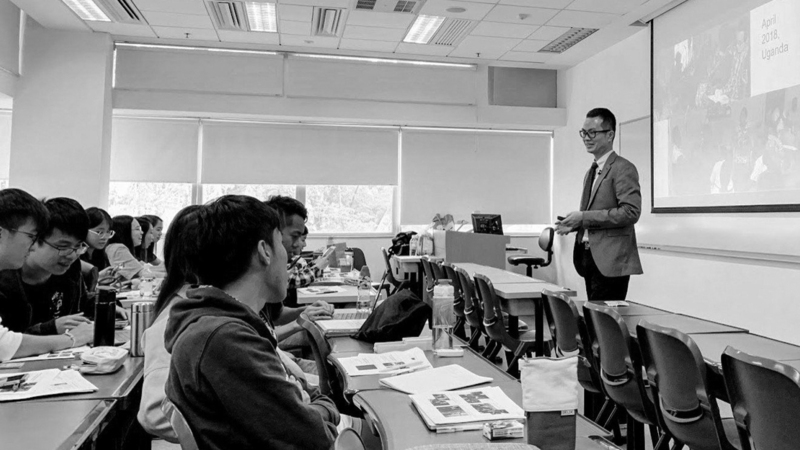 Although he had been living abroad for a long time, Mr. Tsang still supported his alma mater and became a guest lecturer on CUHK’s Global Studies Programme. In this capacity, he sought to pass on relevant skills and environmental awareness to students by sharing his thoughts on sustainability and building a better future for the next generation. Mr. Tsang’s enthusiasm for promoting sustainable development was truly admirable. 1. Make a direct or online bank transfer to the CUHK Alumni Charity Foundation Limited’s bank account. Please send the copy of bank pay-in slip, specifying the purpose of the donation as being “In support of alumnus Victor Tsang Shing-ngai’s family”, as well as the donor’s name, mailing address, contact number and email address, to the following address by post or email. All donations will be published on the CUHK Alumni Charity Foundation Limited’s website (https://cuhkacf.org) in good faith. If you would like to donate anonymously, please notify us. All donations will be sent to Mr. Tsang’s wife, without the deduction of any administrative fees. Note: The CUHK Alumni Charity Foundation Limited is a charitable institution of a public character granted tax exemption under section 88 of the Inland Revenue Ordinance. Donors are eligible to claim tax deduction.